Who Am I This Time is the name of a short story written by Kurt Vonnegut and made into a film with Christopher Walken and Susan Sarandon. It’s a quirky story about two people of very different and uncomfortable personalities -who fall in love while acting in a community theater production of Streetcar. (Hear Walken’s painfully shy, tongue-tied character roar, “Stella! !” during the play within a movie. He is remarkable.) I continue to be a Vonnegut fan unstuck in time and traveling back into his writing frequently. I am reminded of this particular story while working with horses and riders; it’s the question horses ask each time a different rider climbs on. Who am I this time? Do I care to listen? Can I be lazy? Is this a substitute teacher or she-who-must-be-obeyed? (Or best question-) Can I dance with you? Most of us have the experience of mud-wrestling with our horse until we are too frustrated to breathe, only to see our trainer ride that same horse like an Olympic hopeful. Most of us know horses like the mare I rode as a child; she routinely tried to kill grown men but treated me like treasure. If it wasn’t so humiliating it would be easier to respect our horses for their ability to accept each rider without assumption. Horses aren’t fooled by expensive breeches or big talk in the barn aisle. They simply see us for who are as riders. He may be a Grand Prix horse but if you are training level, well, there you are. Horses are brutally honest. I think it’s their best quality. 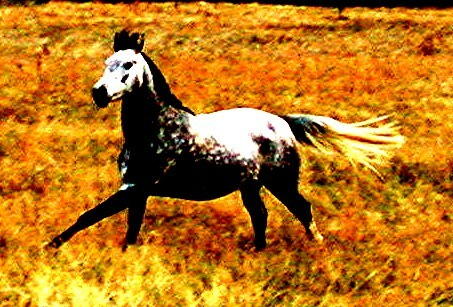 In a world of actors and roles to be played, I know exactly where I stand with horses. I may not always like it but I do trust it. But wait! It was Shakespeare who said, “Assume that virtue though you have it not.” He knew a thing or two about acting. Maybe acting like a good rider is a start. Sometimes our personality isn’t the best match for where our horse is at the moment -but acting the part of a confident rider might begin a path from being the Odd Couple to Fred and Ginger in Shall We Dance? Do you have a Tom Hanks of a gelding? Maybe he’d do better with a Meg Ryan rider than a Church Lady rider. Can acting the part of a happy, enthusiastic Meg Ryan sort of rider really be considered dishonest? Do you have a Meryl Streep (in any role she ever played) sort of mare? Is it too much to ask to be a Katherine Hepburn (in any role she ever played) sort of rider? Who are you this time? Who do you want to be? Wonderful. I’ve been thinking about this (though not as clearly) for awhile. I’m of the opinion that it is not dishonest to act the part needed. Most of us have to draw on some real part of ourselves to “act”, so it becomes…an enhancement. Horses can spot a lie a mile off, but appreciate a rider that makes every attempt to “fiddle with the dial” until the reception is clear. I had a trainer once, who asked her students to pick a top rider they admired, and pretend to BE that rider, in or out of the show ring. The difference was instant, and startlingly advanced – riders improved amazingly.